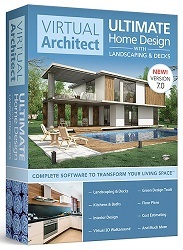 Take a fresh approach to the way you live with Virtual Architect Ultimate Home Design with Landscaping and Decks 7.0. This innovation in home design software delivers the powerful tools and inspiration you need to transform your living space, plus expert help to get the job done right. With Virtual Architect Ultimate Home Design with Landscaping and Decks 7.0, you can plan room additions and other home improvement projects with ease, make your home energy efficient with new lighting and appliances, breathe new life into an outdated kitchen, bathroom or bedroom and so much more. You can even design your dream home, complete with landscaping or a deck, from scratch. No design experience necessary – with our wizard-driven interface, all you have to do is point and click! Design in Photo-realistic 3D: The changes you make in 3D are simultaneously made to your 2D plan - automatically!